The political news around the Neptune station last summer centered around the revelations of NSA spying on US citizens, given to us by the very Neptunian Edward Snowden. For this summer's Neptune station, the poster boy is the mysterious Bowe Bergdahl. Bergdahl is either a military prisoner of war recently traded by the Taliban to the US in exchange for five high-profile Guantanamo prisoners, or a conscientious objector who abandoned his military post and a deserter at the time the Taliban scooped him up years ago -- after which point he joined their cause. The Obama administration plays up the former angle; the flag-waving conservative crowd the latter. Libertarian opinion varies from cheering him for objecting to the US military mission to siding with the other factions. The confusion is an integral part of the picture. 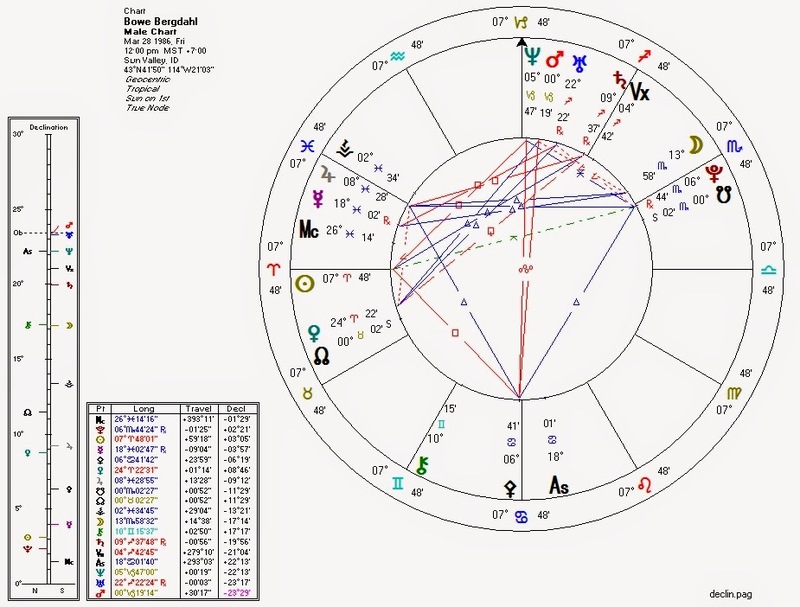 In Bergdahl's astrological chart, we should expect to see some features similar to Snowden's: Pallas involvement with the Nodes (suggesting an individual whose ethical outlook changes over time) and a prominent Neptune. Neptune should be stronger on Bergdahl's chart than on Snowden's. Not only is Bergdahl a mysterious figure whose actions seem shrouded in fog, but he was apparently a prisoner (Neptune) who by some accounts "went native" and adopted a foreign culture and religion (Neptune again). We might also expect to see Pallas involvement with Pluto and the Moon (the combination of these factors is consistent with though far from a guarantee of a military career). Authoritarian: Pallas trine Pluto, ruled by Moon which is probably conjunct Pluto, and trine South Node. Libertarian: Pallas square Sun; authoritarian factor Pluto is conjunct South Node. This is more or less a "whistle-blower" chart. Pluto's affect on Pallas accounts for someone willing to join the military (decidedly against the non-aggression principle ruled by Pallas); the South Node gradually decreases this factor creating a pull towards non-aggression. But here the South Node also acts on Pallas directly in what is probably a weaker fashion, resulting in a somewhat muddier ethical picture. Leftist: Venus ruled by Mars which is conjunct Neptune. Capitalist: Venus conjunct North Node and ruled by Mars which is trine North Node. Why should we care about Bergdahl's economic indicators? Because along with Pallas, they either enable or disable the willingness to violate the rights of others. Here, too, we get a pattern which suggests someone who is likely to develop ethically over time, towards a respect for property ownership (including, crucially, human bodies which are "owned" by the persons wearing them). Conservative: North Node conjunct Venus, ruler of the Moon. Liberal: Moon is in Scorpio, ruled by Mars which is conjunct Neptune and by Pluto which is conjunct the South Node. The Moon herself is also possibly conjunct the South Node. The "liberalizing" factors overwhelm the conservative: hence Bergdahl's reported movement away from culture/allegiances/religion of his birth. Pluto possibly conjunct Moon: betrayal of and/or by one's tribe/family/nation? Neptune conjunct Mars and square Sun: actions and identity in a fog, mysterious, difficult to determine. Sun quincunx Pluto: an uneasy relationship with power. Jupiter square Saturn: idealism at odds with structure/discipline. In June 2009 when Bergdahl disappeared, transiting Pluto was opposite his natal Pallas and quindecile his progressed Pallas. This is consistent with an ethical crisis in which life puts one's ethics to the test. For some, the test is quite extreme and may involve life-or-death decisions. If more of our military were to follow the dictates of their conscience and simply walk away, perhaps our overlords would think a little harder before sending them to kill and die in foreign lands for influence and oil.